Add a touch of style to your entertainment room with this 48" long tv stand. Four open storage shelves and two additional adjustable shelves behind chic glass-paned cabinet doors provide ample storage space to house your favorite movies, components, and game consoles. Cut-outs in the back panel of the unit help keep cables and wires tucked away. Finished in a dark taupe this tv stand is the perfect blend of fashion and function and is a must have in any tv room. 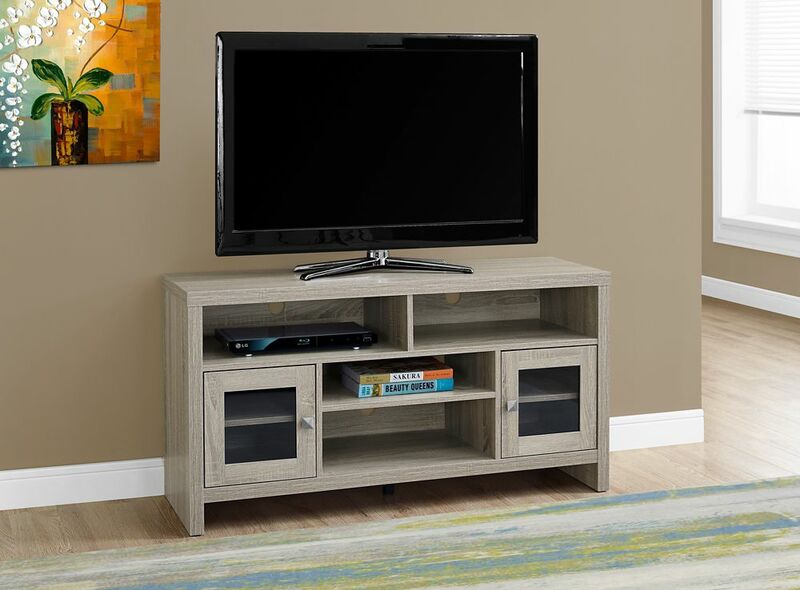 This Media Cabinet is a stylish and versatile entertainment center. Perfect for placing in a living room or bedroom, the cabinet features three doors, interior shelf and a glass front. The antique teal finish is perfect for adding a pop of colour to your decor. Ample interior space provides storage for all of your media essentials. Bring a modern statement to your living room, family room, or den with this sleek thick panelled TV stand in a smooth white finish. The roomy top surface can easily accommodate any TV size with a center stand and a long open shelf space underneath to place audio/visual equipment and gaming accessories. The 2 large gliding storage drawers accented with sleek silver colored handles, are perfect to keep books, cd's, dvd's, or media components neatly in one place. Watch this contemporary TV console unit instantly upgrade your entertainment space! Full assembly instructions are included. Tv Stand - 48 Inch L / Dark Taupe With Glass Doors Add a touch of style to your entertainment room with this 48" long tv stand. Four open storage shelves and two additional adjustable shelves behind chic glass-paned cabinet doors provide ample storage space to house your favorite movies, components, and game consoles. Cut-outs in the back panel of the unit help keep cables and wires tucked away. Finished in a dark taupe this tv stand is the perfect blend of fashion and function and is a must have in any tv room.